When I was a kid my mother would make roast. 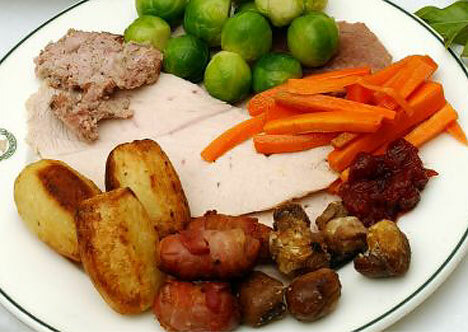 There would be carrots and potatoes as sides along with some bread and the occasional ice cream desert. It was a fine meal, no complaints. As I think about this dinner, that was a common set up for my childhood, I cannot help but think about how this is a representation of how many of us grew up thinking about church. That is to say, every area of our lives had it's own area on the plate. There was the place where we worked (carrots). There was the place where we lived (potatoes). There was the place where we attended church (roast) and there was a place we attended school (bread). Every aspect of our lives was separate and distinct from other areas of our lives. And this is where the struggle lies. We have a growing generation of people for whom all aspects of life are becoming intertwined. We work at home and we play at work. For many people, there is a desire for church to be done in the other areas of their lives as well. Not just on Sunday. That is to say, some people are not looking for a church to be like a roast - separate from the other elements on the plate. Rather the desire is that church would be like a bullion cube - infusing itself into all the other elements on the plate. I desire a church that will be willing to melt or die to itself - to give up being a separate space in my life. I desire a church that infuses itself into all the areas of my work, play, school and life. I don't need more on my plate, I just want my plate to be flavorful. Give me the bullion, you can keep the roast. What is true learning? Not addition. A church person once told me that they attend church in order to learn more and "grow in their faith". When pressed on what they mean when they say "grown in their faith" this church person said to grow in faith is to be built up in the grace and knowledge of Christ. That sounds like a great church answer. Of course we are looking to be shaped in the ways of Christ. But let us address something that maybe we know but forget. Learning is not about addition↬. It is a common understanding that when we learn it is like just filling up a container (our brain) with more information and data. This is a big reason we want our children to go to college, so they can learn "more" because there is a sense of lack without that education. If you have attended any level of education and reflect on your experience, it is clear that leaning is about subtraction rather than addition. We do not come to school with a lack but with an abundance of "what we know to be true" and the challenge of education is that it asks us to not add to "what we know to be true" but calls into question "what we know to be true". Learning is, at its core, about subtraction. When we attend church, and if we are there to grow in the knowledge and grace of Christ, then we must be reorient ourselves away from addition and toward subtraction or (ironically) we will never grow. *On a separate note, this is post #800! Last post touched on a desire of mine to move away from the metaphor of the spiritual life as a journey. To tear things down without offering alternatives to fill the space is not something that is ever productive and many times problematic. So an alternate metaphor to faith as going on a journey to faith as ice sculpting. Ask a sculptor how they make a figure out of ice and they will tell you that they listen to the ice in order to understand how to work with it. The artist respects the shape and history of the ice in order to help bring out the potential it has within it. As the sculptor works with the ice, shapes take form. The sculptor makes the ice. The ice is not the primary actor but it also not without input into the process. There may be imperfections in the ice that result in an unintended fracture, but the sculptor works with it in order to find another way to shape the ice. The ice is a paradox. It is hard yet also liquid. It is solid and temporary. It will melt in a blink of an eye. The sculptor lives on after ice melts. While ice can be shaped it requires a bit of work on the part of the sculptor. And once the ice takes its form it resists changing. But it is not impossible. And once melted, the sculptor can collect the water and use it again to create a new block with a new shape. 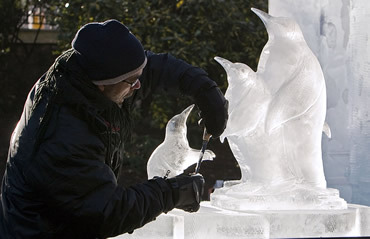 Although not perfect, the metaphor of faith as ice sculpting allows us to explore new ways to talk about faith and what it means to individuals and communities. We can pick it apart, as I have with the metaphor of journey, and find where it breaks down. But the beauty of this metaphor is that it is uncommon enough for everyone to know it is a metaphor and we can treat it as such. 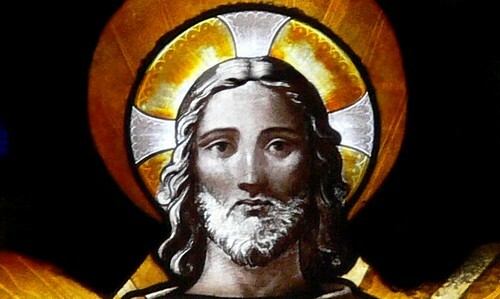 If you have ever seared for Jesus in stained glass, you will find a number of picture of Jesus.Jesus on a cross. Jesus carrying a cross. Jesus with lambs. Jesus with kids. Jesus ascending. Jesus looking like he will karate chop you. Jesus looking like he will own you in a staring contest. We pick out images of Jesus that speak to us and then use those images to make stained glass. And have you noticed that so many of the images are of a peaceful Jesus? I asked a group of people today that if they had one shot to commission a stained glass image of Jesus what would they choose? The image you choose is more than what image you like. The image you choose reflects the image of God you have. The image of God you have directs the way you think about God. The way you think about God has a direct impact on how you live and function in the world. Picking out an image of Jesus for a stained glass is a spiritual exercise. I would pick an image of Jesus turning over the tables or a picture of Jesus out of Mark 5. You may recall a provocative set of pictures created around Jesus by LaChapelle. What is the artist saying with these images? What are you saying with yours?